FAYETTEVILLE, Ark. - The Arkansas International, the biannual literary journal and nonprofit organization run by the M.F.A. Program in Creative Writing and Translation at the University of Arkansas, is hosting a release party and reading from 5:30 to 7:30 p.m. Thursday, March 14, in the Walker Room at the Fayetteville Public Library, located at 401 W. Mountain St. The party and readings are free and open to the public. Issue 6 will be available for purchase at the event and online. The event will open with a light reception of hors d'oeuvres at 5:30 p.m. 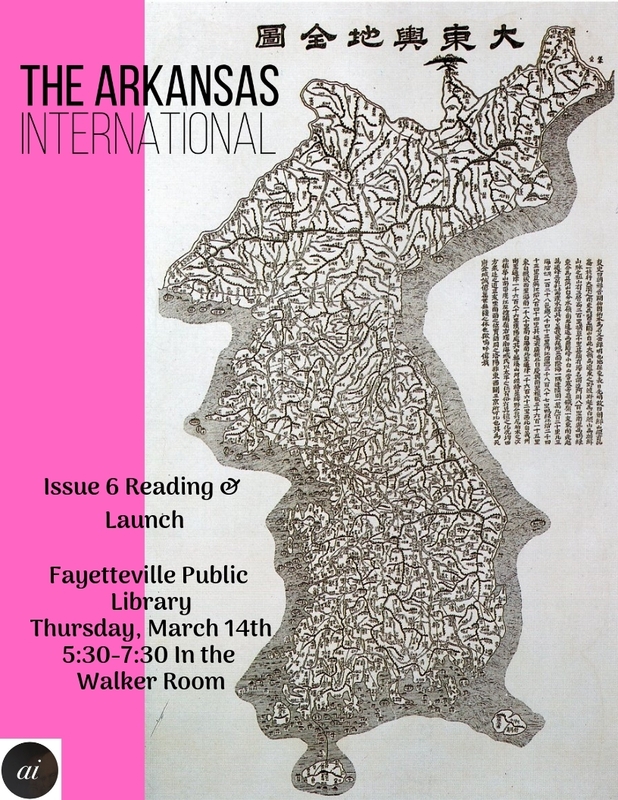 The readings begin at 6 p.m., and will feature a selection of poetry, fiction, comics, creative nonfiction, and works in translation from Issue 6, read by current staff members of the Arkansas International. Highlights of Issue 6 include: four poems by Bob Hicok, a popular North American poet known for meshing witty observation with deep emotional insight; six of Patty Crane's new translations of Tomas Tranströmer, a Swedish Nobel Laureate considered to be one of the most important European poets of his generation; "Teacher," a chilling story by Caitlin Horrocks; and "Seals Are My Favorite Animal" by Maria Kochis, selected by Adam Johnson as the winner of the 2018 Emerging Writers Prize. Issue 6 also features three of Janet Hong's translations from the Korean— "The Retreat," a short story by Ha Seong-Nan, "Picture Diary Two," a comic by Ancco, and "The Dream of a Child before She Was Set on Fire," a short story by Bae Suah. The cover of Issue 6 features a photo by Korean photographer JeeYoung Lee. Issue 6 marks the end of Managing Editor Elizabeth DeMeo's tenure at the magazine; she has gone on to work as an Assistant Editor at Tin House Books in Portland, Oregon. DeMeo says of Issue 6, "I love that we're showcasing pieces by three different authors, but all translated by the same translator— the incredible Janet Hong— in the special feature; I don't see this type of feature often and it captures, to me, what the Arkansas International is about: celebrating the best voices in contemporary literature from around the world, in the form of both original authors and the translators whose work we publish. I also feel like our cover really speaks to the spirit of this issue. It's always a struggle to find the right cover and I think we nailed it!" About the Arkansas International: The Arkansas International is a biannual literary journal and 501(c)(3) not-for-profit organization run by the M.F.A. Program in Creative Writing and Translation in the J. William Fulbright College of Arts and Sciences at the University of Arkansas. The Arkansas International is dedicated to publishing a diverse array of poetry, creative nonfiction, fiction, comics, and works in translation by national and international writers, both established and on the rise.